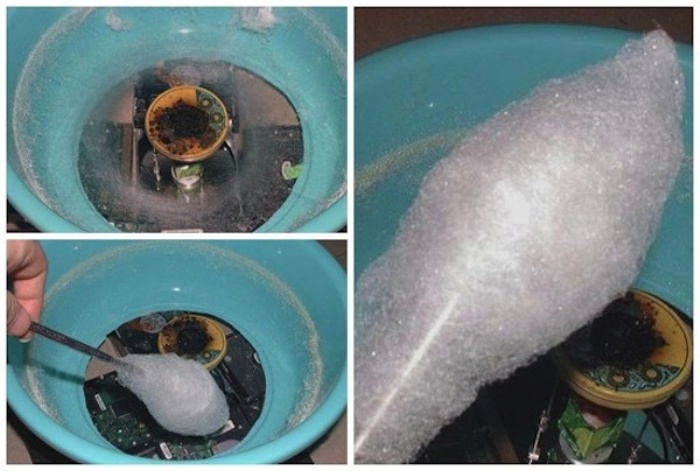 Don’t toss that old hard drive in the garbage, use it to make cotton candy! Now here’s something you don’t see everyday. Or ever. A Chinese engineer in need of a sugar high has constructed a homemade cotton candy machine using an old, still working hard disk drive. That wasn’t all he used, but it’s the key component. Other items in the creation include a small, circular mint tin, half of an aluminum can, a plastic bowl, solid fuel, and six bicycle spokes. And sugar, of course. The result is an inexpensive cotton candy machine that spins faster and presumably more efficiently than a commercial cotton candy machine. This MacGyver-ed machine requires some cutting, drilling, and even welding to assemble, but it’s really very cool. The spinning platter of the hard disk drive powers the whole contraption and forms the base. The aluminum can filled with a small amount of solid fuel, such as Sterno, attaches to the spindle in the center of the hard drive spindle. From there, the bicycle spokes are welded to the platter and to the bottom of the mint tin. The top lid of the mint tin should have a medium-sized hole cut in to it for heating up and holding the sugar. Then, the bottom of the plastic bowl is cut out and placed around the hard drive. Adding sugar, lighting the Sterno, and plugging in the hard drive is pretty much all that’s left to do before sweet cotton candy bliss begins emerging. It works because a basic hard drive spins at 5,400 rotations per minute, while a professional cotton candy machine typically turns at 3,450 rotations per minute. If anything, the faster speed should result in quicker cotton candy, though you might want to be on the lookout for an unexpected spray of sugar crystals when it’s first heating up. We’re truly amazed at this engineer’s ingenuity using essentially random household items (minus the welder) to create something new. While it should go with out saying, that hard drive isn’t going to store any new information now, but it will satiate your sweet tooth. If you have an old hard drive laying around and want to try it yourself, the full instructions can be found via MICgadget. Could a Chrysler 300 diesel make a stylish hybrid substitute - and a statement?